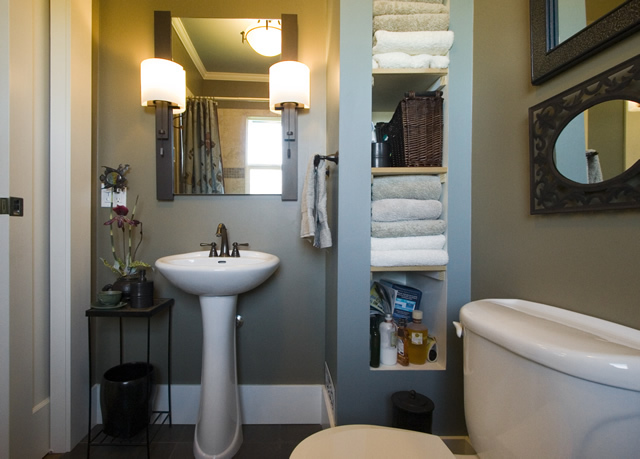 This small bathroom required a complete redo with everything torn back to the studs. 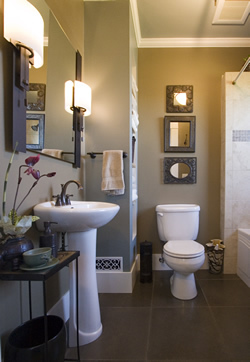 The original bathroom was a 1970's remodel of an old kitchen pantry space that was, in an even earlier life, an exterior porch. 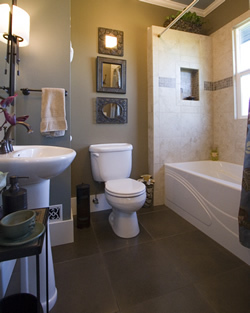 Drafts in the un-insulated wall cavities caused the room to always be cold and the tub never retained heat. The fixtures remained in about the same locations as the old bathroom. But the floor and walls had to be leveled and plumbed significantly to be ready for tile. An electric heating mat was installed below the tile floor. Larger size wall tiles were chosen to minimize the visual impact of the out-of-plumb window. The shelving area was created by reorienting some cabinetry in the adjacent kitchen and moving the wall next to the sink. This gave a more generous space for the new pedestal lavatory. The original entrance to the bathroom was through a swinging door that conflicted with another door outside the room. The constriction was made worse by the old vanity cabinet that stuck into the opening. 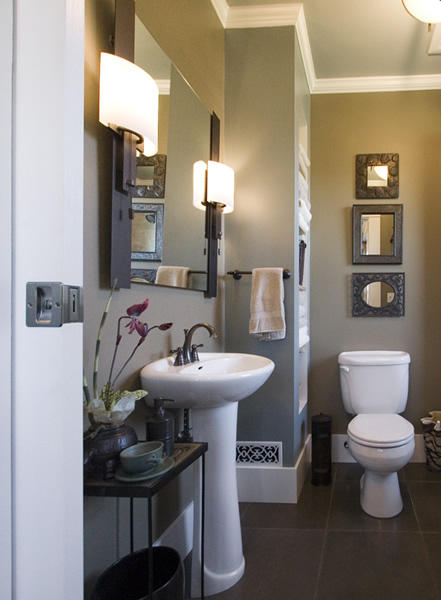 The new pocket door and pedestal sink make the room feel much more spacious without adding floor area.